The March topic for my readers group was The Arts, so I looked through my Kindle app and saw that I had purchased a copy of Vreeland’s Girl in Hyacinth Blue when it was a daily deal. Perfect! 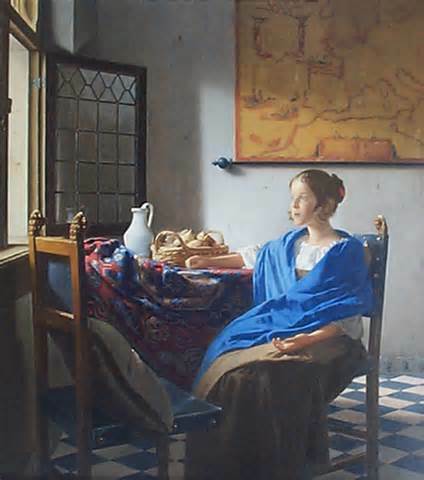 The book centers around a painting by Vermeer of a young girl sitting at a table and staring pensively out the window. Vreeland’s book isn’t a novel so much as a series of vignette’s that center around the painting. It begins with a university professor showing the painting to a colleague and confessing that it was “acquired” by his Nazi father during WWII. The shocked American professor insists the painting must be a forgery as there is no provenance. Subsequent vignettes show how the painting was confiscated by the Germans, and in an earlier century how the provenance was lost. The book seemed disjointed and I wasn’t sure how much I liked it until I got to the two-chapter story about a flood. A young family (and their milk cow) are living in the upstairs rooms of their house because the flood waters have risen so far. One morning, the father climbs out the window to get into his skiff and discovers a newborn baby hidden under an oil painting. On the back of the canvas, someone wrote: Sell the painting; feed the baby. The rest of that chapter revolves around the young wife’s attempts to hold onto the baby and the painting, both of which she has come to love. In the next chapter we learn how the baby came to be in the boat. I really enjoyed this story line plus the final stories that involve Vermeer himself and how the painting came to be. I liked the details of life in the Netherlands at different times in history, as well as the insight into the life of the artist. In the end, I liked the book very much and recommend it. And I do love that painting. This entry was posted in Book Review Club, Uncategorized and tagged art, fiction, Girl In Hyacinth Blue, painting, review, Susan Vreeland, Vermeer by Linda / Lyndi. Bookmark the permalink. Reminds me of the Girl with the Pearl Earring by Tracy Chevalier. Thanks for sharing this! Yes, very similar to Girl with the Pearl Earring, I think. Wow, how interesting! Thanks for sharing this review! I bet this took some time to write–getting to know all the various characters and their stories. And don’t you just love it when you find an unread book on your kindle? 🙂 Thanks for reviewing. I’m sure I’d enjoy this book! Good point, Barrie. There had to be a ton of research that went into writing the book, from the details of the artwork to Dutch culture and the events of the various time periods. An impressive feat. Fascinating. I hadn’t heard of this one before, but I’m always up for anything to do with art and the art world. Thanks for the review! Thanks, Rob. I enjoyed your review, too. Wasn’t able to leave a comment though. This makes me think of a movie that came out a while back about art being stolen during the war. I can’t think of the name of it at the moment though, I’m thinking George Clooney and Bill Murray were involved, maybe? The Monuments Men. There’s another due to come out soon, The Woman in Gold, starring Helen Mirren. My favorite artist. Looks like a good fit. I love Vermeer’s paintings, too. Fair review. I like to get into my novels, and short stories drive me nuts! I know what you mean. Especially when one is expecting a novel. This sounds lovely. Nice to see a book focused on a work of art! Thanks for the review. Now I want to read/see Monuments Men.